ABU DHABI // The five curvy, shimmering towers in a layered cluster reflect every shade of blue from the sea and sky on the west end of the Corniche. The Etihad Towers are not finished but they already dominate in the Ras al Akhdar district. Developed by the Sheikh Suroor Projects Department (SSPD) and designed by DBI Design, Australia’s largest architecture and design company, the towers are expected to reinvent luxury in Abu Dhabi. “Our job was to create buildings that can become reflective of a sophisticated and international city,” says Lawrence Greenman, the senior project leader at DBI. In 2006, DBI won a private competition for the project from six other companies. 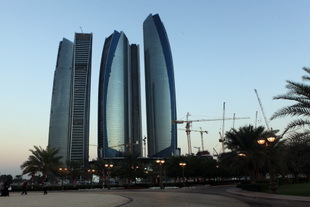 The competition called for a design for four towers by the waterfront at the end of the Corniche. After winning the lead contracts for architecture, interior design and landscape architecture, DBI went to work immediately, and as the project evolved, four towers became five. DBI wanted the Etihad Towers to symbolise the nature and culture surrounding them. “We had a lot of inspiration to draw from in Abu Dhabi,” says Mr Lee. Using the capital’s history as a port city, the designers came up with the idea of billowing sails when imagining the curves of the building. Sketches of falcons and images of overlapping and unfurling flower petals provided the organic quality to how the buildings should be grouped. “The buildings may not reflect these things directly, save for the obvious allusion to sails blowing in the wind, but we relied on these elements for the structural interpretation,” Mr Greenman says. The result is a very specific grouping of the towers, which ensures that from whichever direction they are viewed at least two are always visible. The slightly reflective blue and silver glass used on the buildings bounces light in different directions. Depending on the time of day, some are highlighted while others are in shadow. It is all deliberate. “The way the light bounces off the buildings make them shimmer and the light between the buildings interplays as well,” says Mr Greenman. “It all helps make them look taller and more slender and more elegant. The tallest of the towers, 300 metres and 75 floors, will be one of three residential buildings. Among the three there are 885 apartments, ranging from one to four bedrooms and offering penthouse units. The other two towers will be offices, in the shortest of the five at 54 floors, and a hotel managed by Jumeirah Group, the hospitality subsidiary of Dubai Holding, which will be in the second-tallest tower. Two of the towers sit in a space that will be landscaped by DBI, while the other three spring from a podium base, says Mr Lee. “Within the podium there will be a state-of-the-art convention centre that can cater for groups of more than 2,200, and an 1,800 square metre ballroom that can accommodate 1,000 people for a set menu and about 1,400 people in conference mode,” he says. The towers are planned to redefine luxury in a contemporary setting, including an internationally renowned spa and exclusive retail space. But despite the exclusive feel, Mr Lee insists the towers will be a draw for everyone in the city. “The key to the concept of this development is that it is a very welcoming place, intended to be a place of pride for the city,” he says.